After making enough couscous to solve almost all the world hunger problems I’ve been trying a few different things with it the past few days. Last night I had lamb chops with sugar snap peas and came up with this idea for a really simple dressing. Nice thick sweet balsamic vinegar with fresh mint. It’s essentially a mint sauce but without any need for sugar. So anyway, I had this meal and it worked really well. I didn’t quite cook the lamb as I wanted as I didn’t get the lamb fat as crispy as I would have liked. 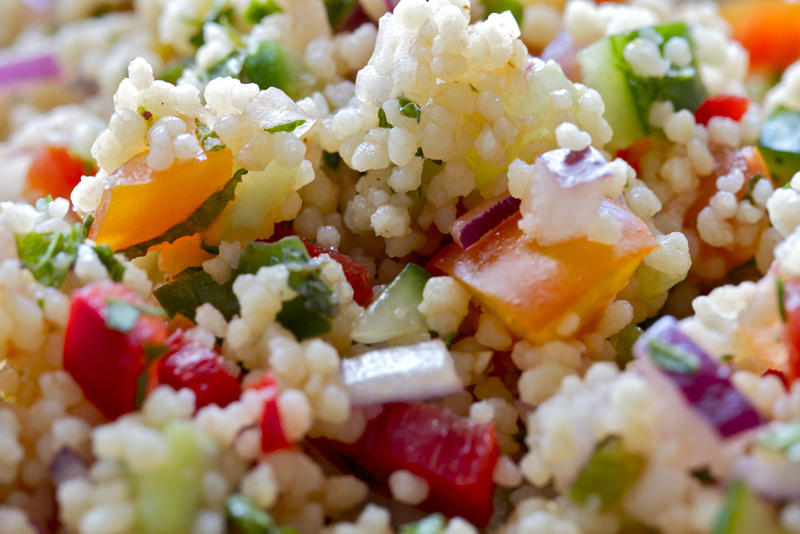 It got me thinking that cutting off some lamb fat and frying it off so it goes all crispy and adding into the couscous salad just before you serve it. I think it would be well tasty! I went to the butchers with the intention of getting some more chops so I could try this idea out. However I saw these great looking racks of lamb so I thought I’d give that a try. You get quite a nice amount of fat on these and you can get away with cooking it in the oven for a bit longer which should allow the fat to get nice and crispy. 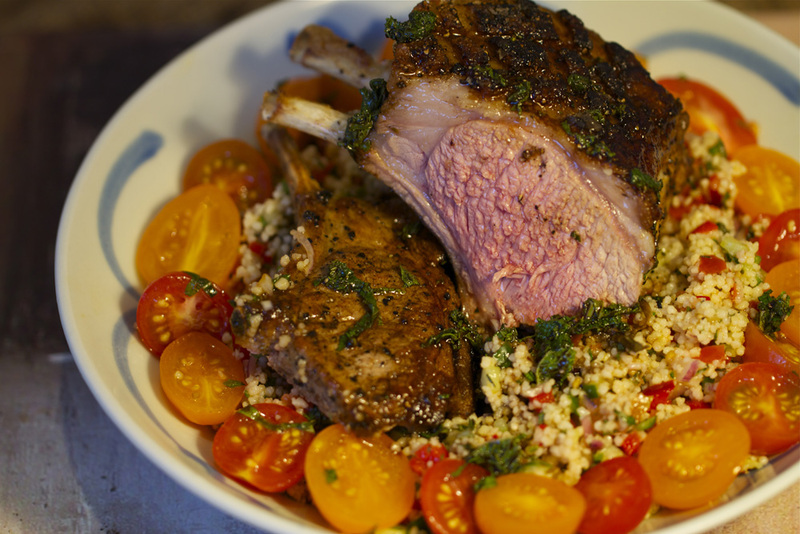 If you’ve made yourself the couscous salad the day before then this recipe really only involves cooking the lamb. It’s really simple and it looks pretty impressive and its tastes great. 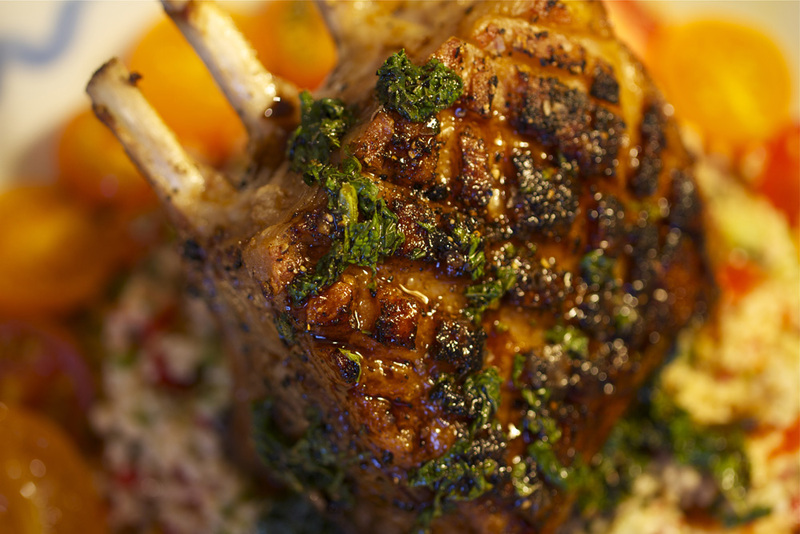 Rack of lamb you want at least 3 chops together for each portion about 300-350 grams per person is loads. This really helps to keep the lamb juicy and looks well cool. 2. heat up a frying pan. Get it nice and hot at add a splash of oil. Season the lamb all over with salt and pepper and put in the pan fat side down. We want to fry off this side until it has taken some colour, maybe 2 mins. Now turn over give in 1 min then put on it’s end for 1 min then it’s other end. You will need to use some tongs for this to hold it there. As soon as you have done this put it in a roasting tray and chuck in the oven for about 20-25mins. It will depend on the size but 350 grams will take about 20 mins ish. You kind of just have to use the force to guess when it’s right to get it out the oven. I did mine for 23 mins and it was 355 grams and came out perfectly. 3. While the lamb is in the oven slice your cherry tomatoes in half drizzle a tiny bit of extra virgin olive oil and season with salt and pepper. Put to one side. Now in a bowl pour about 2 tablespoons of good quality balsamic vinegar. If you can get the thick stuff then all the better. Now finely chop a handful of mint. Add a pinch of salt, pepper and a splash of olive oil and the mint to the balsamic vinegar and mix well. 4. 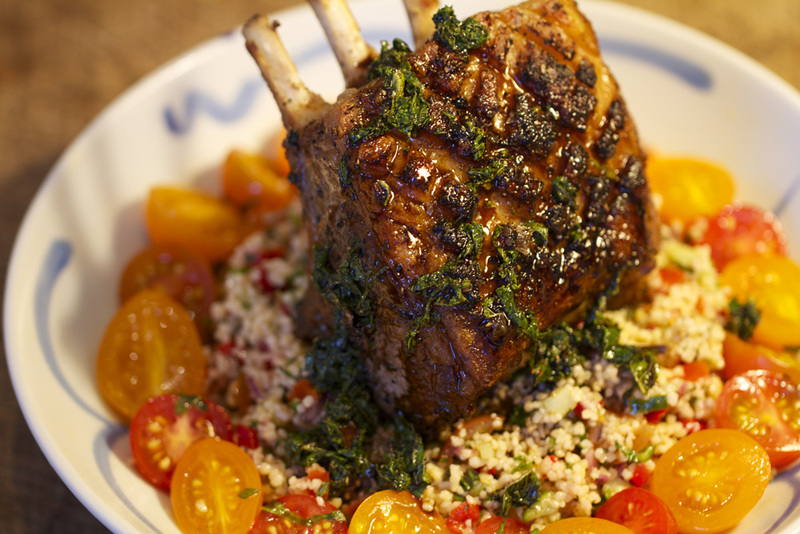 Once the lamb is done take out the oven and put on a chopping board or plate for 5 mins to rest. 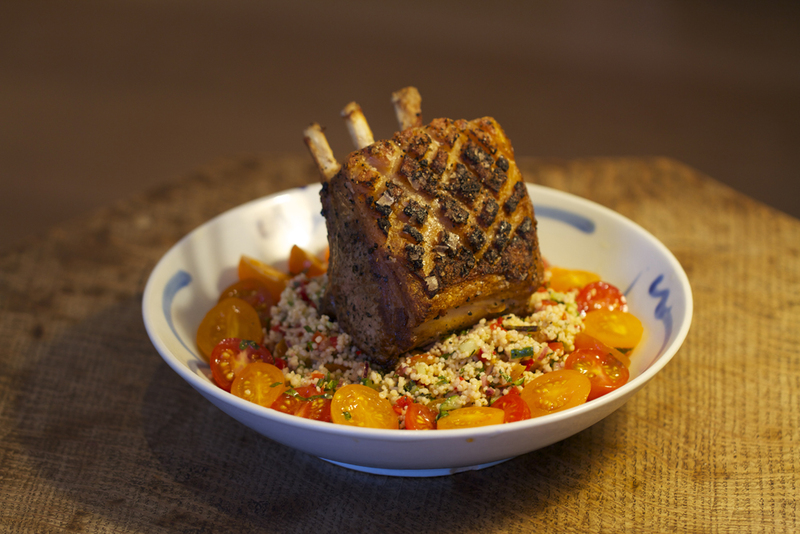 While this is happening plate up the couscous arrange the tomatoes around the edge and pop the lamb on top. Drizzle over the mint dressing (not too much or the balsamic will over power everything) there we go! Serve it with some crusty bread. Sorted!